So far this year, Mr. Market hasn't been kind to Nike, American Express, or General Electric. 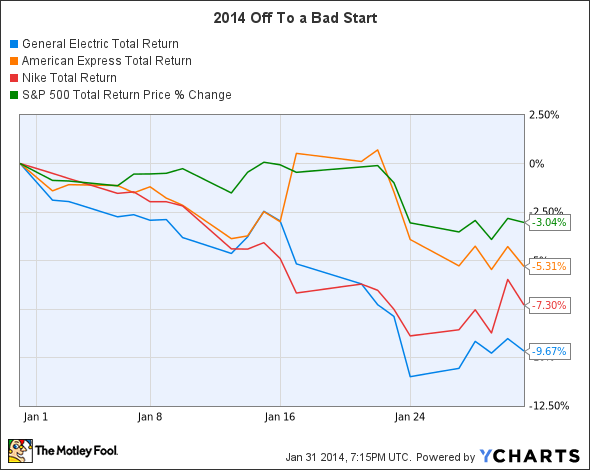 For investors looking to find value stocks in 2014, the timing looks pretty good. During 2013's bull run, value investors were finding it hard to find stocks that didn't look expensive, but so far in 2014, Mr. Market has taken his foot off the gas. Not only is the Dow down 4.5%, but some of the best brands in the index have fallen even further. The best part? Three of them are "own forever" brands that smart investors should take a hard look at. Are Nike (NYSE:NKE), American Express (NYSE:AXP), and General Electric (NYSE:GE) the best value stocks for 2014? Let's take a closer look. Motley Fool co-founder David Gardner has said that he starts with the assumption that the market is "right" when a stock drops, and his amazing track record lends some credence to that idea. Most importantly, it means that we have to prove that the market is wrong when it comes to the long-term value of investing in these companies. 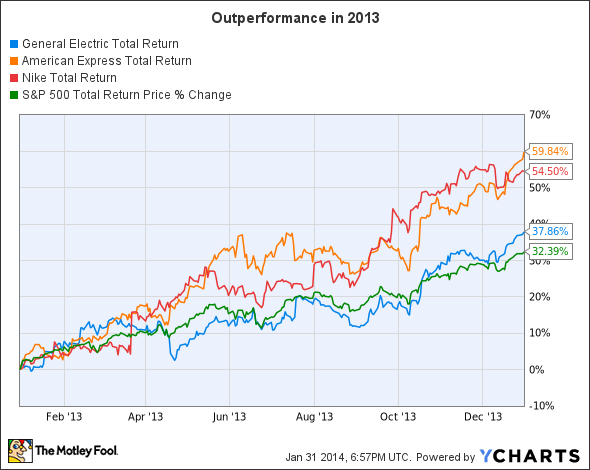 Let's start with General Electric, which announced a strong finish to 2013 a couple of weeks ago. Earnings per share increased 20% over the 2012 quarter, European orders were up 36%, and the company returned $18.2 billion to shareholders via buybacks and dividends over the full year. There were particularly strong performances in the oil and gas business and the aviation segment, which both showed sales growth of more than 10% for the year and profit growth of 13% and 16%, respectively. What's really important? These two business segments generated $11 billion in sales in 2013 -- more than one-third of the company's industrial revenue. With oil and natural-gas production expanding around the world, and aircraft orders for the next several years at record levels, GE is well-positioned to continue delivering strong results. Nike's latest earnings report, released on Dec. 19, also indicates a great future for the dominant brand in athletic apparel and footwear. Nike grew sales by more than 8% and increased gross margins thanks to a shift toward higher-end products and continued strength in the company's more profitable direct retail channel. Nike also repurchased more than $400 million in shares over the quarter; since the current $8 billion share repurchase program was initiated, the company has repurchased $1.72 billion in stock -- some 29.2 million shares. Based on today's market price, that's $2.13 billion in value returned to investors. Future orders were up 11% versus the year-ago quarter -- an indication that sales growth for 2014 should remain strong. Add in Nike's marketing push in emerging and global markets, and the future looks bright. CEO Mark Parker made it clear during last year's investor conference that Nike is focusing on this market, stating: "Over the next decade, we will see the world's middle class population grow by 1 billion consumers. ... We have 5 very powerful high-energy brands, each with its own meaningful connections to athletes and consumers all over the world." American Express more than doubled earnings in the fourth quarter to more than $1.3 billion. But this great news comes with the caveat that last year's quarter featured some significant charges due to restructuring, lowering the bar for a big beat. However, results that reflect strong growth -- namely a 9% increase in cardholder spending in the U.S. -- are expected to continue as the economy steadily improves. While these are positive indications for the short term, a larger global view paints an amazing picture for the coming decades. In the developed world, especially the U.S. and much of the West, the lion's share of transactions are via credit and debit cards. However, when we look at transactions in much of the rest of the world, the vast majority of purchases are done with cash. For American Express, the growth of the global middle class that Nike's chief mentioned will drive a new generation of consumers toward digital and card-based commerce. The potential is enormous. Face it: It's impossible to tell what any of these company's stock prices will look like in a year. However, looking at the long-term prospects of all three brands paints a picture that -- over the next five years and longer -- strongly indicates market-beating potential in the stock. Do they fit your portfolio? That's up to you decide. Looking for something different? Here's three more value stocks to consider.